Left Perth via the Northern Freeway on to the Brand with our first stop being the small country town of Gingin. During a stop at the cemetery for inspection of the kangaroo paws which were exquisite in their magic scarlet and emerald colours our Fearless Leader (FL) announced that there were many more species of native bees than singlets. We knew then it was going to be an amazing journey. Amongst the kangaroo paws we also marvelled at orange catspaws, Cottonheads and Purple tassels. It was during this day we also saw the insectivorous plants - one with a bright green grasshopper caught in its sticky delicate hairs. On our second stop along the road in the Moore River National Park we found the Rose Banksia (B. laricina) a rare and endangered species that grows nowhere else in the world. Apparently it's very desirable for dried flower decorations especially in Japan where it is used for Ikebana. We also saw other typical bush plants of the coastal plain and northern sand plains - Hakeas, Grevilleas and other species of Banksias. John discussed the case for proposing the SW region for World Heritage status. The region has 9,000 species of plants as well as many animals found in the existing national parks and nature reserves. Another stop along the way was to marvel at the largest flowering Eucalypt of all - E. macrocarpa - great fat pink blossoms on this low spreading multi-stemmed (malleee) shrub - it didn't look anything like what we expect when we see a eucalyptus tree. Our next destination was The Pinnacles - a unique formation of limestone outcrops in a sandy "desert". It's like a giant Lilliputland. In the carpark we saw the quadong bush festooned with clematis. Our FL demonstrated how the clematis is used by the Aboriginal people to cure headaches - you rub the flowers vigorously in your fingers and then inhale deeply - the top of your head gets a big blast and hey presto no more headache (at least that's what he says). On the road we stopped for Alan and FL to collect some quandong fruit which quite a few of us tried - beautiful shiny round red fruit the size of crabapple. Our next stop was on the road to Jurien Bay where we found in the heathland large shrubs of the unusual propeller Banksia - its seedheads shaped like a ship's propeller. Shortly after this our FL gave us the benefit of his views on a large international oil company and none of us will ever buy its petrol again. We fetched up at Jurien Bay with the alarming prospect of not being able to buy petrol for tomorrow's journey. While dinner was being prepared Doug recited some Banjo Patterson - Clancy of the Overflow and the Man from Ironbark with great panache. Dinner was pumpkin soup and Vietnamese spring rolls - how exotic out in the scrub. The day got off to a slow start with a conference of electrical engineers trying to work out how to stop the bus from emitting a continuous high pitched scream without disarming all other features. Finally we just did without the speedo. Along the way we saw the tree lucerne agriculture owned by Janet Holmes a'Court.Alan informed us of the wind patterns of the area (north-easterlies compared with south westerlies around Perth). We saw the Leschanaultia which features so prominently in the paintings by the wives of the early settlers (e.g. Georgina Malloy). We arrived at Hi-Vallee farm the home of the exurberant Don and Joy Williams in time for billy tea and damper. First of all he told of the wide variety of plants (Of the 4900 acres 2000 acres are conserved with 500 species of native plants). This wide variety is dued to a mosaic of soil types, the overlap of two botanical regions and the length of time over which evolution has been developing its diversity. Then he talked about the many ways in which plants have developed to survive fire. We then set up to walk through the kwongan (prickly no go area). Hakea neurophylla - for the ones who took seeds: Put in a warm place for several weeks and try to get the nut open to get the seeds. Then put in white sand and it should grow anywhere! Anyway it has beautiful pink flowers. Gastrolobium bidens (poisonous plant, but not to native animals, except the dingo) Nowadays its formula is used as a poison 10-80 for animals that are not native. In all we examined more than 80 species. Last but not least we saw a Wedged-tailed eagle chick in its nest. All this mega-diversity cost us a very late lunch which tasted extra good at 3.30 pm. En route back we saw white-tailed black cockatoos in their natural breeding habitat. A fruitless search was made for the Xanthosia southern cross by the last botanists still standing at the end of a long and incredible day. The day broke to the usual uncertainty, would the bus work? We sunned ourselves, talked and read until FL returned from the auto electrician with the job half done. We had a speedometer but no back door warning siren. Such is life! Our first stop was a tour of the Jurien Bay crayboat harbour with all the very expensive boats high and dry. We headed north. At least we got that right, even if we were an hour and a half late. The first town we passed through was Green Head. We didn't stop but had a lovely view of a blue bay with white sand - a bit too seaweedy to swim in. FL was not fearless when it comes to swimming in cold water. We drove up the coastline, past numerous squatters shacks, that the local authority had legitimized by rating but the state government is now trying to shift. We had morning tea at a crayfish landing/transfer point, where there was lots of seagrass and a couple of alleged eels. There were cormorants (aalscholver) sitting on the rocks. Doug and several others had a swing on a crayfish buoy hanging from at tree. Nearby we found sea spinach (....Tetrogonia ...), blue fan flower (Scaevola .....), Geraldton carnation weed (Euphorbia .... ) and the nice purple Salvation Jane/Patterson's Curse, just some of the many European pests we were to see in the farmland we were passing through. Some pelicans flew over. We joined the Brand highway and went onto Dongara, an old town now home to a lime plant, a boat harbour with rows of cray boats out of action and a beautiful old mill building, that is to become a hotel. The road carried us on to Greenough. Here was an interesting historic village (that we didn't stop at) where the buildings have all been restored. We saw the fascinating trees that had been blown over almost horizontal, by the strong winds. The totally dry riverbed at Greenough was a surprise. We had lunch at Geraldton, where the wheat silos tended to spoil the skyline, and a strong wind blew the salad off our bread. Some of us went on to the museum. Those that were born to shop, went shopping. The museum was fabulous and deserved an hour and a half instead of 40 minutes. It reminded us all of the important role the Dutch played in early contacts with our country and impressed on us the horror of being shipwreckd on the rugged coast we were later to see. On from the museum to the "pretty" pink carotine lake at Port Gregory. We passed an historic convict depot on the way. Here we saw Leuchenautia lineroides. The lake was being said to produce a component of vitamin A from red algae grown in super saline water. On then through a change in landscape, north of Port Gregory, as the limestone through which we had been travelling changed to silicious sandstone and the sheer cliffs fronting the sea, which proved such a problem for the East India Company, began to develop. But there was more..... In the gathering dusk when we smelt already our beds the plant of the day made its appearance. Grevillia lucopteris (white grevillia) is a small 3-4 m bushy tree with stunning white flowers. Onward through a minefield of crossword puzzle to a pointless search of the horizon from the impressive towering cliffs at several locations for the whales John promised. Not a fluke was to be seen. Somehow we thought this was no fluke but, as the sun sank slowly in the west some of us did see the stunning green flash that comes with the instant of sunset. And so to bed at the Police Citizens Youth Club Camp at Kalibarri. We got off to a late start because someone stole the tea towels, Doug kept on taking the Other Road, Manfred kept sweeping the same spot, Ina and Sue started collecting ticks and someone left their "smelly socks" behind. Most of us had breakfast outside the community room watching pelicans and galahs flying up the beautiful, peaceful Murchison River. As we left Kalbarri we admired the dexterity of the fisherman who had to negotiate the double reefs at the river's mouth. We forked off the main road onto a unsealed road - the whole area is yellow Tumblagooda Sandstone. We stopped at Nature's Window - a large hole in a jagged sandstone outcrop overlooking the Loop in the Murchison river, a very popular tourist spot where everyone had to be photographed looking through the Window. Several feral goats were seen and also an osprey cooling his feet in the river. (How do you know it is a he?) The more adventurous of us (Cynthia and Janet particularly) explored a little further along the track and Doug had a big discussion with John about getting down to the river, but in the end we all returned to the car park for morning tea. Back onto the bus and off to the spectacular gorges of the Z Bend. Lots of interesting and varied wildflowers were all around us on this track including a patch of "Clotted Cream" Verticordia eriocephoda and the tiny brightly coloured flowers which grew straight out of the sandy ground (a kind of Parakeela, a little yellow Vellea and Lobelia tenua). As a change from the flora, at the side of the track there was a yellow striped dragon lizard freezing for us. "All aboard!" once more and a few minutes later, after narrowly escaping having to dig ourselves out of the sand, we stopped for some "botanizing" amongst the big bad banksia men. Some of the other flowers we saw in the Kalbarri National Park were Grevillea leucopteris (smelly socks), G. petrophiloides, G. annulifera (prickly plume grevillea), G. eriostachya (flame grevillea), sand plain cypress, an Eriostemon, Melaleuca tuberculosis (a pink one), two kinds of Calatrix (a white one and a purple one), Beaufortia aestiva, Pileanthus peduncularis (orange copper cups), twining fringed lily, a Baeckea, Physopsis lachnostackya (lamb's tails), woody pears, pattersonia, 3 different kinds of smoke bush, and a cassia. After leaving the Kalbarri National Park we stopped on the roadside for a quick photo of white, yellow and pink everlastings as John told us that we may not see masses of them again. We eventually joined the North West Coastal Highway after an emu had strolled across the road in front of us. For something different, a late lunch was had where the highway crossed the Murchison River. This spot was covered with large fluffy Mulla Mulla. We left at 2:45 pm for the long drive north to Monkey Mia, stopping only after 2 hours continual driving in the, by now, stony desert surroundings of the Mulga to check the different flora. Little does John know how close he came to being sued for inducing DVT (Deep Vein Thrombosis). Flowers seen here were Solanum phlomoides (Kangarro Apple), another kind of Mulla Mulla, saltbush, a purple swainsonia. Then we had an ice-cream - at the Overlander Roadhouse where we refuelled the bus and us. We headed off to Shark Bay. It was now 5:15 so no time to stop and look at the stromatolites - (dash!) we'll do that on our way back on Thursday. At Shell Beach we crossed the Fox and Cat Fence (built for Project Eden) to give the native animals sanctuary once the foxes and cats had been eliminated from the Peron peninsula (it has taken more than five years apparently). Racing failing light we watch the sun sink below a cloud with a green flash. Denham, the centre of the Shark Bay Shire, is guarded by 3 wind generators and from there we crossed the peninsular to arrive at Monkey Mia in the dark. This was one of the rare times when we had freedom of choice. Some chose to see the dolphins being fed, others walked on the beach, a group went walking with Alan on the Nature Trail and some relaxed in the hot tub. At 10 we boarded the bus for Francois Peron National Park. On arrival there, we scattered to view various interesting interpretations of the porperty which until 1990 was a sheep station. Because of the difficlut nature of the vegetation, sheep could not be mustered in the usual way but were trapped and held in holding yards at each watering place. This could take up to two months to muster the entire flock. As always a mad rush to keep up to schedule. Never have sandwiches been prepared and eaten so quickly. A quick run to the wharf and all aboard the Shotover for an afternoon of relaxed fun and firvolity. The catamaran had been sailed from Brisbane to Shark Bay - exactly half the circumference of Australia. Its mast had been originally built for "Gretel" of America's Cup fame. (Shades of Dirk Hartog.) The pristine water of Shark Bay is home to herds of dugongs, some of which we saw this afternoon. It's good to know these peaceful animals may safely graze on the sea grass and are under no threat. Homeward bound we were accompanied by several dolphins who dived and played around and under the boat. We were offered a sunset cruise but no one showed interest - preferring to have our happy hour on terra firma. First stop to replenish stores at Denham. One of the early pearling luggers the "Galla" (named after an Italian opera singer) rode at anchor in the bay. Morning tea at Shelly Beach - beach entirely made of shells 5 metres deep - it has been mined since 1960. Coaches were able to drive along the beach until 1993 when that nonsense was stopped! The fox/cat fence stretches 200 metres into the water there. As we crossed the fox/cat barrier on the road dogs can be heard barking from a recording. This happens when anything passes through the sensor. We got out along the road at a claypan - a salt lake called a burrida - these were formed when the sea level was higher than it is today. Next stop was Hamelin Pool which has one of two stromatolite salt water colonies in the world - the other being in the Bahamas. They date back 3,500 million years but their significance was only recognised in the 1950's. They are the earliest form of life on earth. On our way to lunch at the old telegraph station (built in 1884) we passed the shell quarry which is only used now to restore existing heritage buildings in Shark Bay. We arrived at the Old Convent - a stunning two storey building made from Murchison River stone - next door is the Church of St. Mary's also made from the same stone. Lloyd thinks will all be uplifted by staying overnight in such a holy joint. Up early and explored the town. St Marys Church built in 1936 of the same stone as the Convent - it's in a pleasing Gothic style preferred by the founding Fathers of the Parish which was established in 1868. The architect was Monsignor Hawes. Left Northhampton by the Chapman Valley which is an agricultural area with river gums and acacias with roadside planting and some wildlife corridors. There was a discussion about tree planting on farms and education of farmers. First stop we noticed something more than "smelly socks" and then a little further at the site of a 1930's Yuna East Public the colourful flowers were patches of pink and white everlastings, yellow billy buttons and one gorgeous large patch of bright blue brunonia. Interspersed with such beauty were large patches of Boria (aka Pincushion plants). 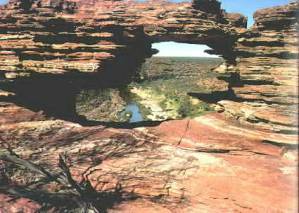 This landscape is very old (the oldest known rocks come from the Pilbara). Shortly after we stopped to photograph magnificent displays of the succulent, Parrakelia amongst the yellow and white everlastings and several metres further on was the sign to a glacier bed where there is a moraine with erratics carried by the glacier 225 million years ago. We joined the railway line which used to go to Mt Magnet but now only services the wheat silos to Geraldton. Morning tea at Mullewa (Ernie Dingo's home town) where a helpful lady from the tourist information centre brought us brochures and told us where to see the best flowers. We stopped to look over Our Lady of Mt Carmel church, also the work of Hawes in a quite elaborate Mediterranean style built in 1924. The bellringer gave a description of the church - the inside of the church had lots of little coloured lights and a ativity scene inset into the wall, also with lights! The church had some beautiful leadlight windows. From Canna we detoured about 5kms where Wreath Leschenaultia was reported to be flowering. 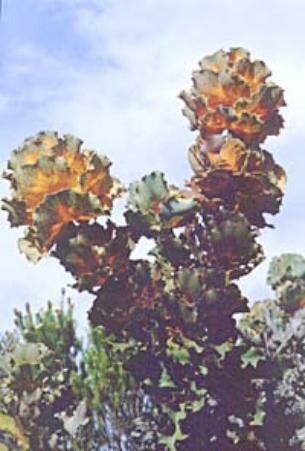 Many specimens found and photographed. We enjoyed an excellent bush picnic here followed by a brief stop at Canna store where they "can do" everything! During the afternoon we paused to photograph three quandong trees full of ripe red fruit. For some it was their first taste of this fruit! Dallwinu - a township we passed through 120 kms from our destination is almost entirely populated by Plymouth Brethren. The town appeared very prosperous. At the refuel stop of Wubin we had 139 kms to our destination and during this time two crosswords were successfully done! Arrived at New Norcia, a monastic town to our accommodation in a vast and elaborate building. The morning began with an interesting if damp exploration of the community of New Norcia. The simple Georgian architecture of the monastery and the chappel (c.1850) contrasted with the monumental style of the school buildings. The chappel contained a painting of the nativity with Australian animals around the crib and also a painting of Our Lady of Good Councel brought from Italy in 1845 and said to have repelled the bushfire. We passed the Julimbah Conservation Park where threatened native species have been re-introduced, and on to have morning tea at Toodyay, lunch at Northam, and a juppie coffeestop at York (established 1831). Northam is also note worthy for the park where Victoria broke the under sixteen state discus record. After an early BBQ at the forestry huts we went spotlighting for woylies (and possums). We looked forward for spending the night in the coldest spot in the south of WA in forestry huts (built 1930-1960) with outdoor dunnies. Moving on from there, we passed through the woodlands that Claire had spoken about last night - mallet plantations and casurina thickets. Taking firewood from the bush was forbidden as it takes away the primary food source for numbats (as termites, which the numbats eat, live in the fallen wood). Travelling through farmland,with a few salt pans on the way, we reached Narrogin for morning tea, and had our cuppas in terribly windy and cold conditions. We stopped in Ngarojin Park, where the town had recorded its history in tiles on a pathway. The record included a piece of poetry by an aboriginal Elder, who died before the process was completed. A town we call home. Who show smiles on our faces. And live in the future. Continuing on through the wheatbelt, we passed more wheat and canola fields and small towns, one of which was Wigan. This town appeared to be the centre of the wool industry in the area, witness to this was the huge well endowed ram (the ram was 9 times the size of an average sheep) located in the town park. we drove onto the Stirling Range. The mountains showed themselves between stunning yellow fields of canola below and dark clouds above. We checked in to our digs at the Stirling Range Retreat (run by Ayleen and Tony Sands) in Borden. After a short pitched battle over who was to sleep where we dropped the trailer, took our places in the bus again and headed off in the rain in search of rare banksias on a longand slippery track. We were again successful. We found them! - Banksia Coccinea. (A scarlet banksia about the size of a cricket ball.) We also found some Southern Cross (Xanthosia). A white flower with four flowers making a cross, we had been searching for on a previous day. At sunset we had a fast 7 minute climb to a lookout with wonderful views on the Sitrling Ranges and the surrounding area. We had a fantastic meal, including a perfect dessert of strawberries dipped in Bundy Rum, brown sugar and icing sugar, caramelised over flame of metho and finally dipped in cream. Today was a day in the ranges meaning we each had to pack our lunch at breakfast. Fourteen intrepid adventurers set off for the steep climb to Bluff Knoll (1095m and a 6.2 km return walk). It's the highest peak in the Stirling Ranges and one of the highest in WA. The remaining 6 of us decided on more restful activities. Some of them even gave into their cappuccino addiction. It seems though that some of them did try walking a little, and what do you know, they found patches of orchids along the kangaroo track that runs along the electrified fence. There were a lot of orchids - much better value than a dollar each! It was a good walk to Bluff Knoll - a well marked walking track most the way with a few parts scrambling over rocks along streamlets - with many steps. A fire went through last January so there was a lot of new growth on the burnt tree trunks and many grass trees and Kingea (drumsticks) in flower. A great many Southern Cross flowers were along the track sides, patches of tiny red sundew rosettes, little crimson boronias and a few fairy (pink) and china (blue) orchids. 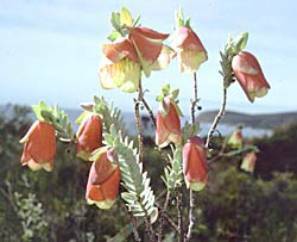 Among the big granite outcrops right at the top were the Mountain Bells (Darwinia collina) which grow nowhere else in the world except on a few peaks in the Stirling Ranges. Eleven of us made it to the top taking between one hour ten minutes and a little over two hours. The weather gods were with us as the clouds had cleared and we had a fantastic uninterrupted 360 degree view from the top. Five or six lakes were visible in the south, the many peaks of the Stirling Range in the north and west, farmlands stretching away to the north and south and a ridge to the east ending at Mount Ellen (1012m). A little brown bandicoot ( a Quenda) hopped amongst us at the summit cleaning up our apple cores. Then we all went back down at our own pace. Some of us stopped for lunch on the way down and were entertained by a wedge-tail eagle flying backwards and forwards along the valley below - a wonderful view looking down on the eagle. The way down was a lot less tiring than the struggle up. John met us with the bus, tea & bikkies at 1:30PM. Quite a few of us were dropped off at the information board near the Bluff Knoll cafe - to which we headed after closely inspecting a bobtail lizard for ticks. After a cappuccino shot (some of the badly addicted took to Viennese coffee and "home-made" iced coffee) several found the Victoria and Jill Trail. They saw many orchids there. The rest of the afternoon was up to ourselves. Some of us slept to recover from the ordeal. Others went on the Retreat bird walk (led by Clive Napier of the Birds Australia) and saw 22 different birds in an hour and a half, including a brown honeyeater's nest with two little white eggs in it, an Elegant Parrot, two Rufous Treecreepers and a Tawny Frogmouth. Meanwhile John took another group to an area of Wandoo forest about 5 km up the road where we saw many orchids, banksias and hakeas. John was particularly enthusiastic about the "dog's balls" hakeas (according to Alan it was a hakea testiculata!!!). Everyone then relaxed around the campfire with happy hour before getting into a really good pasta dinner and marshmallow dessert. An early start from Stirling Range National Park gave us a full day of travel and associated delights. At Borden (population possibly 50!) we were unable to get diesel and fresh white bread (for Victoria) but found the posting box very convenient. The public areas were well cared for and the gardens contained wild flowers, red grevillia andPittosporum phylleraeoides. With an eye on the fuel gauge, John decided to head straight to Bremer Bay - our first sight of the ocean for many days and what a delight it was with white sands and aquamarine sea - unforgettable. Entering Fitzgerald National Park, low vegetation stretched endlessly on either side of the road. The Barren Hills were sillouhetted against a mackerel sky. Alan had promised spectacular new species today and this proved no exageration. Our first sighting of Hakea Victoria (very prickly, as was the old queen Vic) brought ooohhs and aaahhs of amazement. John was keen to reach Quaalup Homestead for lunch. At first glimpse it looked extremely interesting. We didn't know immediately whether our accommodation was over here or over there, but this was sorted quickly to everyone's satisfaction. Lunch was hastily taken in the comfort of the cottage and it was "all aboard" for whales at Point Anne. Alas no whales! (John's arangements had fallen through!) Spectacular scenery and a staggering range of plants more than made up for this. (Maybe whales next year.) It would be impossible to list the names or varieties of the dozens of plant species we saw today. Sufficient to say they were truly amazing, beautiful, unusual, weird and incredible. Further details may be obtained from our second fearless leader Alan, Barbara, Colleen, Ina, Fia, Graham, Gayle, Janet, and most others. As the sun sank slowly in the west amid purple and gold clouds we wended our way home to the cottages tired but happy. Surrounded by happy hoppers we enjoyed a few drinks before partaking of John's gastronomic delights. Awoke to beautiful birdsong at Quaalup Homestead. Outside the house where we cooked was a Eucalyptus burdettiana with lovely pale yellowy green blossoms. After breakfast some of us walked out along the road to see what we could find. We found the Quaalup Bell (Pimelia physodes) and Burtonia. We were picked up and drove off to photograph the Scarlet Banksia and met one of three rangers who cover Fitzgerald River National Park. (International Biosphere Reserve). Later in the morning we crossed the Pallinup River into the area of the City of Albany on our way to Two Peoples Bay for lunch. Suddenly there was a dramatic flapping sound - we had shredded a trailer tyre. Thank goodness we had spare tyre but horror! - no wheel brace to fit the tyre! We had to flag down two cars before we got the right sized wheelbrace. The botanists among us discovered so great flowers at this unscheduled stop. A bright red sphaerolobium (pea flowers) and four different orchids. We got to Two Peoples Bay shortly afterwards. Its name is Baie de Deux Peuples as a result of a Frenchman and an American, Midshipman Ransonnet and Captain Pendleton meeting there in 1803. The former on an exploration of the uncharted area and the latter was searching for seals. We had our usual lovely lunch and then visited the splendid Visitors Centre to hear the sound of the male Noisy Scrub Bird and learn a little of the Gilberts Potaroo and its habitat. There are 50 known specimens but so far no success in breeding in captivity. FL dropped us in Albany for an hour to explore and later we drove along the coast of the town in the hope of spotting a whale or several without success. We drove around the coast in the other direction to Camp Quaranup across the bay from Albany. The Camp is the former quarantine station and we stayed in the old nurses quarters with a stunning outlook across the bay. That night we had our party and many talented performers did their thing. Special mention needs to be made of Barbara Bailey and Gale Bearman who sang in exquisite harmony Po Kare-kare Ana - a traditional Maori song - this was particularly clever of them as they had had almost no time to practise. Our marvellous Dutch contingent sang/spoke a tale based on Hieronymous Bosch and the Dutch landscape in Dutch which they had got off the internet in the Albany library the same afternoon. FL told some previous travellers' tales - one of the difficulties of going to the "loo" in the northern tribal highlands of Thailand (this written to indicate the relative ease of ablutionary expeditions that we experience on his tours in Australia. Also a terrific poem about his hat (and what goes on underneath it). Manfred read a lovely poem by Robert Grey about Bellingen. Barbara Bailey also composed and read an A to Z covering the many excitements we have experienced in the last two weeks. Cynthia told two stories she had learnt from the Aboriginal people about why Darwin got bombed and the origin of the platypus. Lloyd and Barbara each told a story from their last trip to Cape York - one related to a nightime encounter in a nightie and the other to a Chinese take away. Colleen read some hilarious anecdotes from a Maurice Glietzman book. Doug told a very droll joke about three old men. Victoria and Jill each contributed a joke from their very spare store. Alan read a poem about emigration from the UK to Australia. No matter, the view over the harbour's superb. The isolation hospital will be beaut when it's finished. Wake up, hurry up, what's up? shut up. "Up" means "place of" Quaranup -place of quarantine. Karri tees and dairy cows love the drizzly rain. Smell the damp forest. It rains 185 days in the year. What a contrast with those other places we've been. Thank you C.A.L.M. for this experience. Drive to Walpole Inlet where Alan and family camped. Clematis, hovea and hardenbergia among the tall trees. Marron are delicious but don't go poaching for them. Marks the Olympic torch relay. And a donation to F.I.D.O. After a very comfortable night at Perup Forest Ecology Centre we approached the day in a leisurely way with some going off on our last walk, guided by Alan and others taking up the challenge in a game of 500. 9 spades was Doug's undoing - tempted beyond strength. He will remind FL that he had a moral victory. We drove to Bridgetown and had our morning tea stop in the War Memorial shelter due to a slight drizzle. The café latté set went off for cappuccinos again. Our drive towards Bunbury took us into heavier rain and caused a circling of the beaches to try to find shelter for our lunch event. Eventually the difficulty was overcome by recourse to "Eddy's Fast Food" or Graham and Fia's Sandwich Bar (in the bus). Although the rain continued it did not stop the intrepid travellers from viewing the thrombolites in Lake Clifton. Up to 10 000 years old, these structures continue to grow as the micro-organisms precipitate calcium carbonate from the fresh waters of the lake. Through the rain and fogged up windows the Yalgorup National Park, with its lakes and sea shore, appeared an interesting place to revisit. On our drive into Perth, FL dropped people off at their places of accommodation and after an engagement with a couple of cars in the CWA carpark, FL proved once again his flair for backing bus and trailer. A bold few ventured out in a Perth thunderstorm amid lightening and a downpour for an evening meal. Grahame and Fia turned up at the airport at 6.30 am on Saturday instead of Sunday and Ina was still pondering the mysteries of the Ansett collapse and how she was going to get to Darwin when last sighted. So some took in the sights of Perth amid the showers, as others visited friends in Perth or took airflights home, their minds and hearts filled with images of flowers, foliage, beaches and heath. A is for Alan, our expert naturalist, Albany and the Avon with its white swans at Northam. C is for Cynthia, Coleen admiring a hakea, clay-pans and coffee made with tea. D is for Doug, dolphins, dugong, cold Dryandra and damper at Hi-Vallee. E is for colourful Everlastings, emus and Project Eden at Shark Bay. F is for Fia, and our Fearless Leader de-fusing the bus, and Fitzgerald National Park. G is for Gale, Graham Gin Gin cemetary flower and Geraldton where Vic lost her teeth. H is for Hi-Vallee Farm, a rare Hibbertia, and Happy Hour with fast flowing red. I is for Ina, part of our Dutch trio and ice-creams at the Overlander. J is for Janet, Jill and Jane, Jurien Bay and Lake Joondalup. 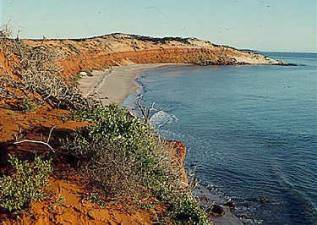 K is for Kalbarri (Who stole the tea-towels?) kangaroos and their paws, and King George Sound. L is for Lloyd, left behind in Wagin, lambs tails, lizards and scenic lookouts. N is for Northhampton convent, cold, cold, Narrogin and queing for photos at Nature's Window. O is for lots of orchids, an osprey paddling in the Murchison River and Ouch Bush. P is for our Pick-up Point, Perth, Port Gregory's pinl lake and the Pinnacles desert. 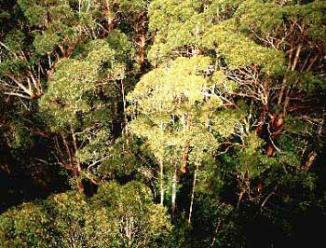 Q is for Quaalup bells and homestead, a quenda on Bluff Knoll and us eating quandongs. R is for Renee, Ruth with wet feet at Freshwater Point and a well enowed ram at Wagin. S is for Sue, Shark Bay,daisies, soaking in the spa at Peron and the Stirling Ranges. U is for Useless Loop'a salt, umbrellas at New Norcia and upside-down peas. V is for Victoria remembering her discus record at Northam, and the valley of the Giants. W is for Wreath leschenaultia, Water-Wheel in Gin Gin, Wandoo and no Whales. X is for our eXciting eXperiences, eXcellent food and eXtra stops when asked. Y is for York's huge Town Hall and cappucinos and Yuna's big silos. Z is for the Zig-Zag boardwalk to view the amazing stromatalites and the Z-Bend in the Murchison Gorge. List of Books for someone new coming to Australia to learn about this country. Though just how it is measured I cannot say. Or possible it is sold by the gram or even the litre.